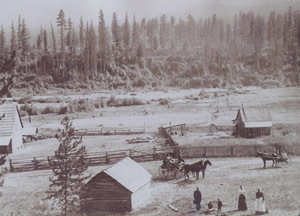 On August 13, 2003, Lisa Langelier, the refuge manager at Little Pend Oreille National Wildlife Refuge, provided a program for the Northeast Washington Genealogical Society about the history of the refuge and her interest in hosting a reunion of descendants who once lived in this area northeast of Colville. An Executive Order of President Franklin D. Roosevelt established the Refuge in 1939. Prior to establishment, the land was traversed, used and settled by Indians, homesteaders, farmers, loggers, and many others. During 2003, the Centennial year for the National Wildlife Refuge System, Lisa attempted to document as much of the history of the area as possible and share these stories with others through interpretive materials and historical collections. * To document the pre- and post-refuge history. * To develop an oral history program to record the memories of interested persons. * To develop an historical database for use on cultural history interpretation. Daily, William M; Davis, William D.; Diehl, James I.; Dreyer, Harry H.
Graf, Charles A.; Gregory, E.B. Hall, LeRoy; Hammond, George E.; Hard, Daisy; Harris, Lester A.; Hathaway, Ellis A.; Hay, William A.; Hilton, Olive A.; Hoag, Bertha and Ellery; Hotchkiss, Velma M.
Keno, Frank C.; Kenyon, L.B. ; Knudson, K.
Lange, A.W. ; Lee, R.E. ; Loddick, John H.; Lorenz, George C.
Palmer, Harvey Ray; Paulke, Otto and Lina; Pierce, Nelson S.; Poole, Helen B.; Price, E.H.
Sampson, Sam; Saxton, Thomas R.; Schumaker, Viola; Singer, George, L.; Slaybaugh, Russell C.; Somes, F.R. ; Sorenson, Hans L.; Stavens, Elsie M.; Stephens, Emma J.; Stolt, John Estate; Sturdevant, Minnie S.
Lisa seeks the following: names of descendants and former refuge employees, information from journals, letters, photographs, diaries, newspaper articles, land use histories, and any other historical information about previous settlers, neighbors, refuge employees and their offspring. If you are interested in learning more or could help with information contact Lisa Langelier at 509-684-8384. 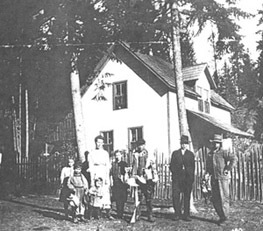 This house was built by Archie MacDonald and occupied by the Cook family ca 1920. From left Alois, Ben, Della, Shannon, Jean, Clarence Brittenger, Mr. JT Broadwater, and Billy Cook. Where was this homestead and who did it belong to?